We are house sign makers and offer these fonts for customers to customise the text on their house signs. 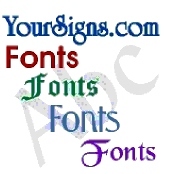 - Not all of these fonts are suitable for house signs, we recommend you take a look at our standard house sign fonts on our main website first. If you don't find a suitable font there, then have a look at the selections here.